This opinion piece was curated and sparked by Basic Invite, home of the truly custom invite. Twenty years ago, I had a reputation for being the fastest thank you note writer, possibly in the entire state of North Carolina. Some guests at my wedding had their thank you notes arrive at their home the Monday after my Saturday wedding. Fast forward to my life today and I'm now the worse thank you, writer, on the planet. What happened? Kids happened and the quick ease of sending an email happened. I am to blame, but I also blame the digital age. I feel as if my Southern manners have gone to pot, which is not a good thing. I still love customized stationary though and I like to have a stash in my antique secretary desk for when the need arises. I buy personalized stationery for myself and even for my children, who would rather get their fingernails peeled off than write a thank you note these days. Despite the complaining, it's my job to teach them to do the right thing expected of a recipient of a gift. I want them to grow up and know that handwritten thank you noteson proper stationery are a part of life. I'm also instilling in their little brains that if they are to ever host a wedding or baby shower then they better order paper invitations for the event. I certainly get why online invites for kid's birthdays or quick potlucks or neighborhood parties are popular. It's easy, and sometimes, things are done impromptu. Trust me, I live an impromptu life now. It keeps the cost down for an event and it works for those occasions. 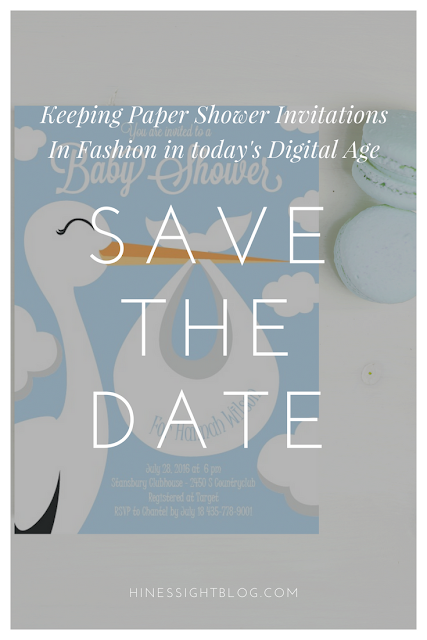 But, I beg you to please keep the tradition of paper invitations alive for wedding and baby showers. These are such wonderful milestone events in someone's life and embracing some of the past in this technology-ran world is nice. You can order customized printed invitations online instead of making the trip to a local store these days, but whatever route you decide to do it's so considerate to celebrate milestone events with paper invitations. I went through a dry spell where I was not invited to a wedding shower or a baby shower in many years. But, I have moved into a neighborhood with friends younger than me and I have a baby shower to attend for my neighbor next weekend. I received a paper invitation in the mail and I loved it. I love paper invitations because I can hold it and put it on a bulletin board as a reminder. This invite didn't get buried in my email where it typically takes me a long time to find it again. I also promptly RSVP'd for the event. I've been known to forget to RSVP online invites because I don't do it right away then I forget about the invite in an email. 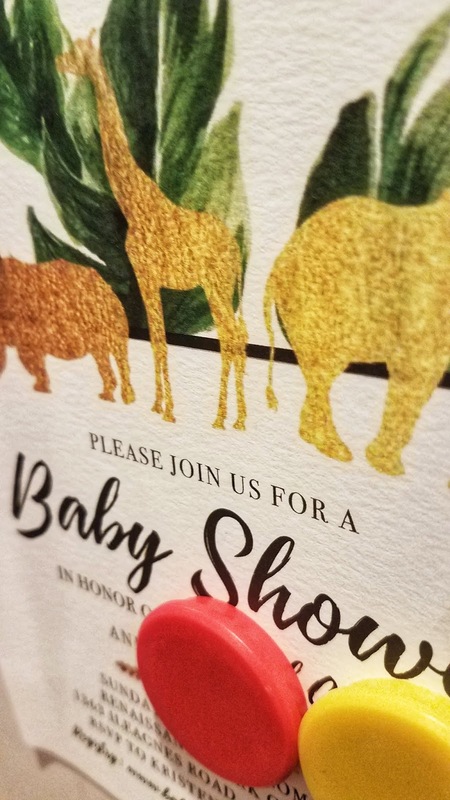 The hosts for this baby shower chose an animals baby shower invitation design and apparently that is the biggest trend right now for baby shower invitations. 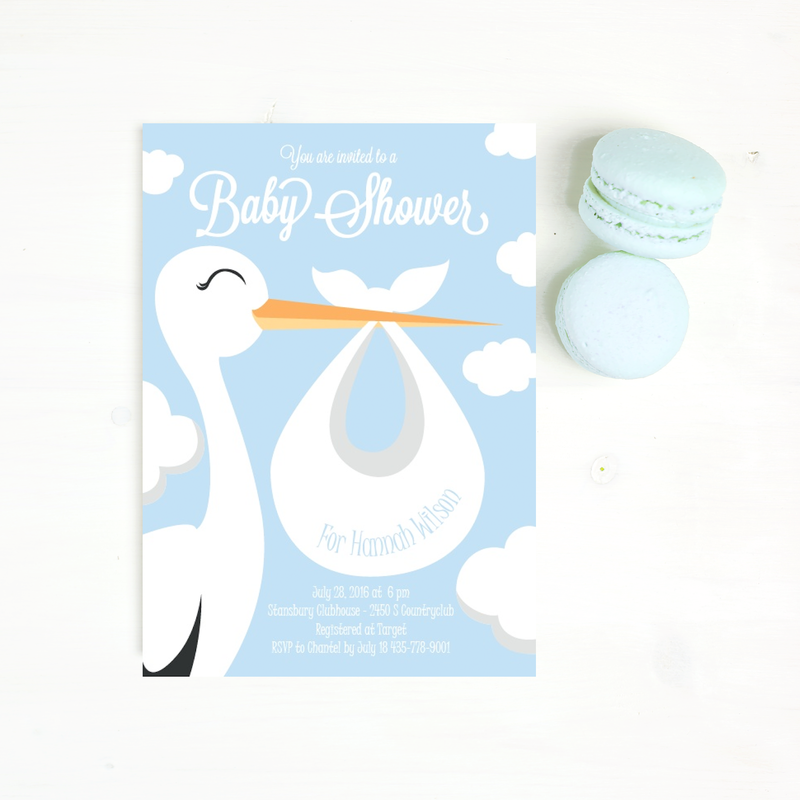 Of course, I spent an hour or so looking at the designs and one of my favorite designs is in the baby showers for girls templates. It's for twins and it's two smiling peas. It's adorable. I also like this template below for craft brew loving parents-to-be. When I was pregnant with Jack, some friends of ours hosted a couple's shower. I think in today's world, it's nice to keep the tradition of paper, but think outside the box when hosting an event. 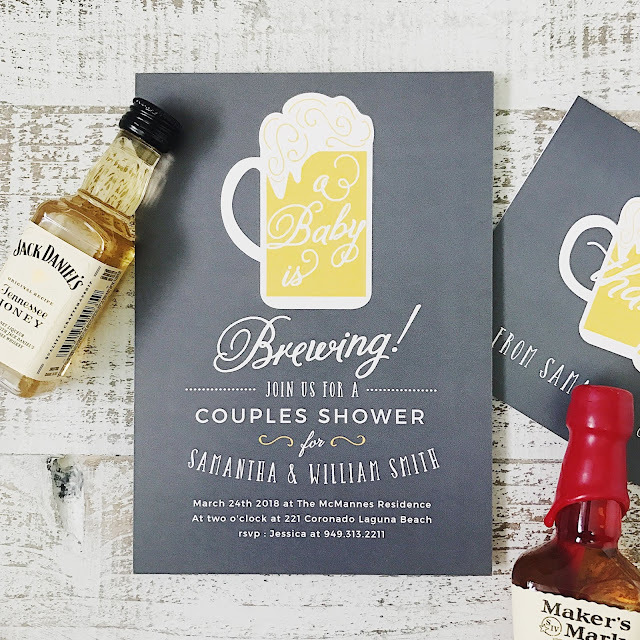 The invitation pictured would be perfect to host at a local brewery, just make sure you have some sparking punch on hand for the mom-to-be. I'm entering a new stage of life, and some of my college friends now have children getting married or are having babies. Will's aunt, who is at never at a lost for words, said this past weekend that fifty plus is truly the golden years. I believe it. It's fun to have milestone events on the calendar again instead of birthday parties at the local jump place. 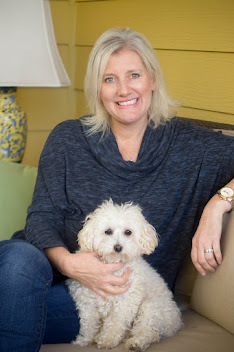 Of course, when she turned 50, her children were out of the house and grown. We've got a ways to go on that empty nest front. 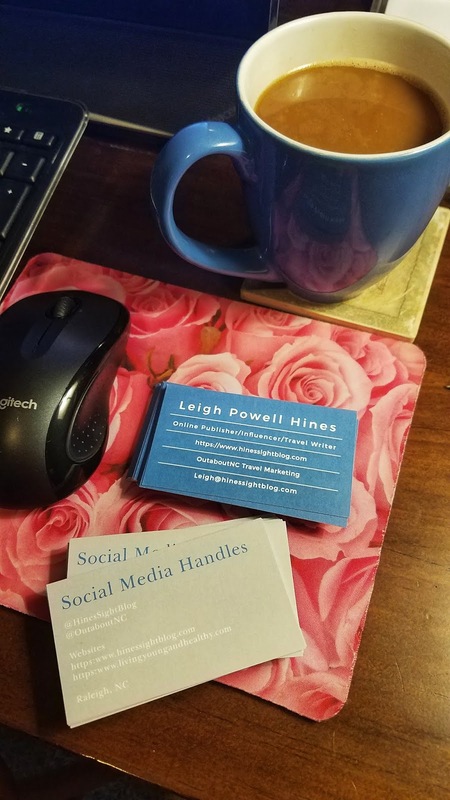 I'm not hosting an event anytime soon, but I did order some new business cards from Basic Invite and I love them. Ordering and customizing them was a breeze. They are two-sided cards. The ordering process would be the same for online invitations or stationery. I recommend the company for your needs. Here are a few things that set this company apart from other online stores. 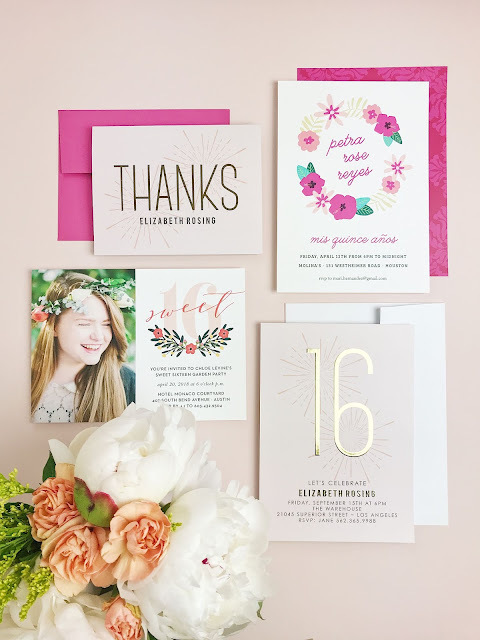 Custom Samples - Basic Invite is one of the few websites that allows customers the ability to order a printed sample of their actual invitation so you can see exactly how it will print as well as the paper quality before you have to place your final order. Over 40 Different Colors of Envelopes - Basic Invite is just as colorful with envelopes as it is with its invitations. 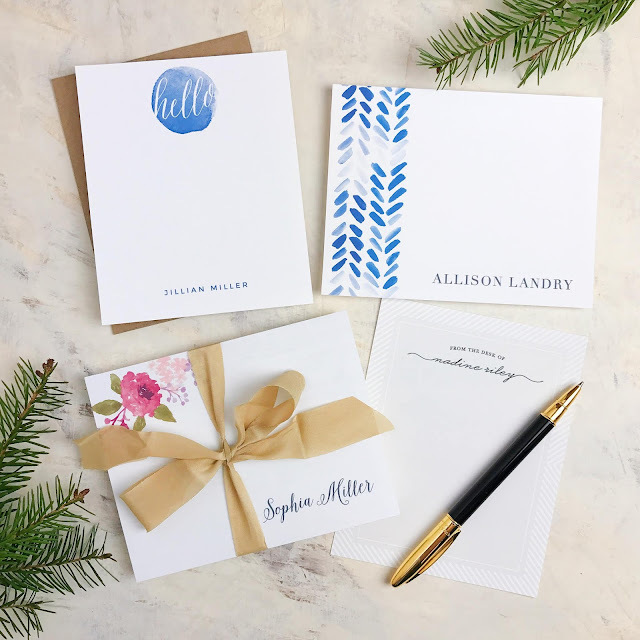 Customers can choose from over 40 different colors when it comes to their envelopes so that you can make your invitation stand out even before it is opened. All of Basic Invites envelopes are peel and seal so the envelopes can be quickly and securely closed. I will definitely use Basic Invite again for stationery or any future events I may host. If you re hosting an event in the future, this coupon code of 15FF51 is valid for 15% off for a limited time. How do you feel about printed invitations and customized stationery? Are you a fan like me? 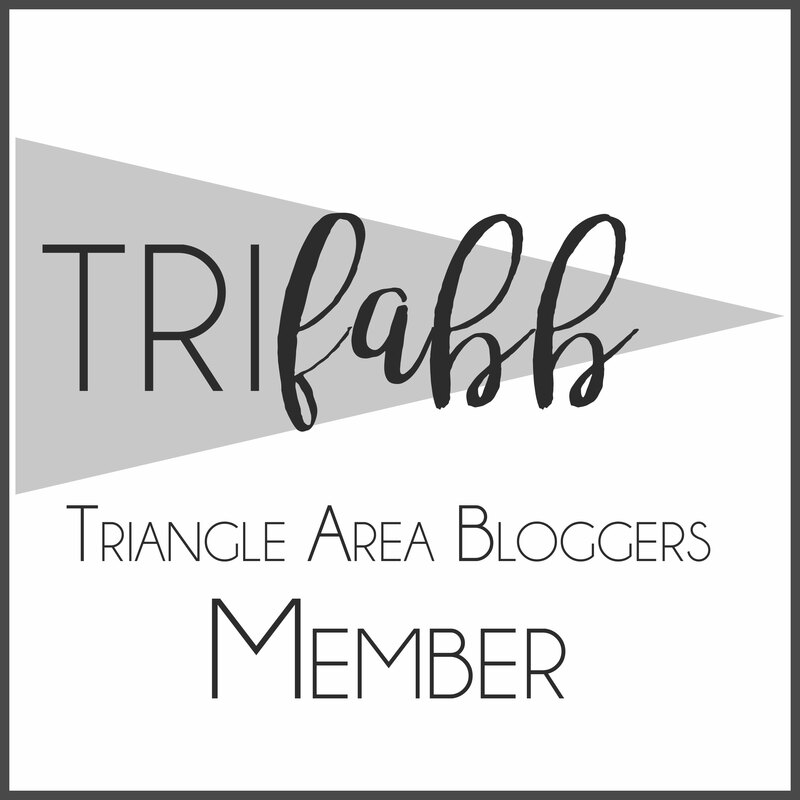 FTC Disclosure: This post is sponsored by Basic Invite. The conversation was sparked by their sponsorship of my writing, but opinions of this company are my own. If you're a food lover and are visiting Raleigh, N.C. you will be glad to hear that you are coming to a fantastic part of North Carolina. Restaurants in the Triangle area are expansive. We're quickly becoming a top culinary destination.The City of Raleigh has its share of good places to eat almost on every street corner and that's great news for a first-time visitor to Raleigh. For this post though,we are going to concentrate on lunch spots near NCSU (NC State University). 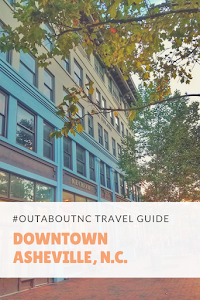 For those of you who may be visiting Raleigh for the first time, the good news is that you can get to a lot of local great restaurants (think downtown, North Hills and even Cary, NC) quickly, but I wanted to pinpoint where to eat near NCSU. 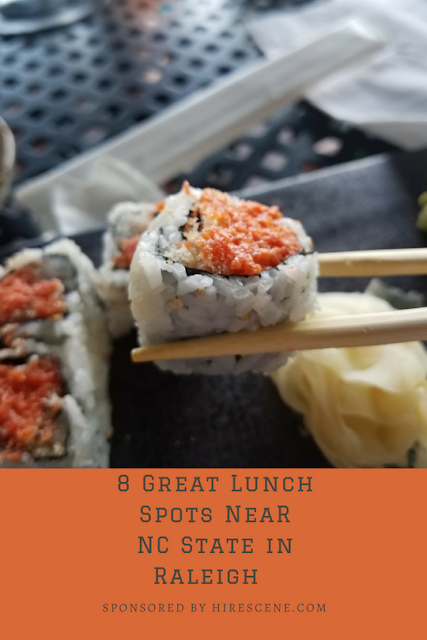 We are concentrating on restaurants near Hillsborough Street, Western Boulevard, and NC State's Centennial Campus for these great lunch breaks. We could add more to this list about dining near NCSU, but I had to stop somewhere. There are so many choices for dining on Hillsborough Street and the vicinity of campus. When visiting Raleigh, the NC Farmer's Market is a must-experience when in town. 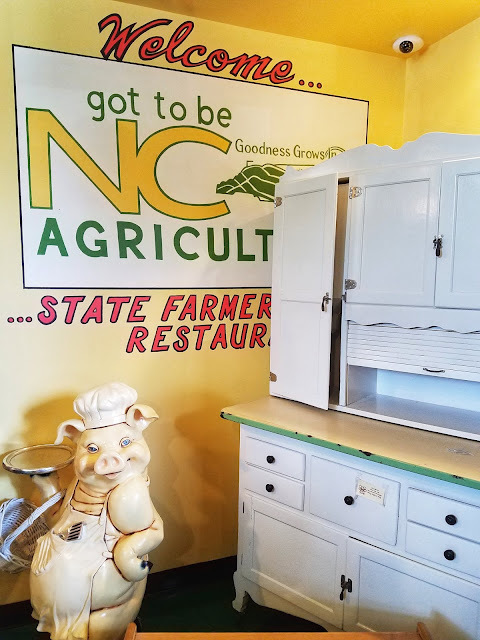 It's adjacent to Centennial Campus and the wide-open area houses a hot dog stand, the NC Seafood restaurant, and the biggest draw of all, the State Farmer's Market Restaurant. It's only open for breakfast and lunch, serving until 3 pm. It's one of the few places in Raleigh where you can get breakfast all day. No matter when you go, it's always packed so be prepared for a short wait. It's first-come, first-serve. This Japanese restaurant in Cameron Village has a great lunch special. Ajisai, a Japanese-fusion-sushi restaurant, offers indoor and outdoor patio seating and attracts visitors with its specially-priced lunch menu for under $10. 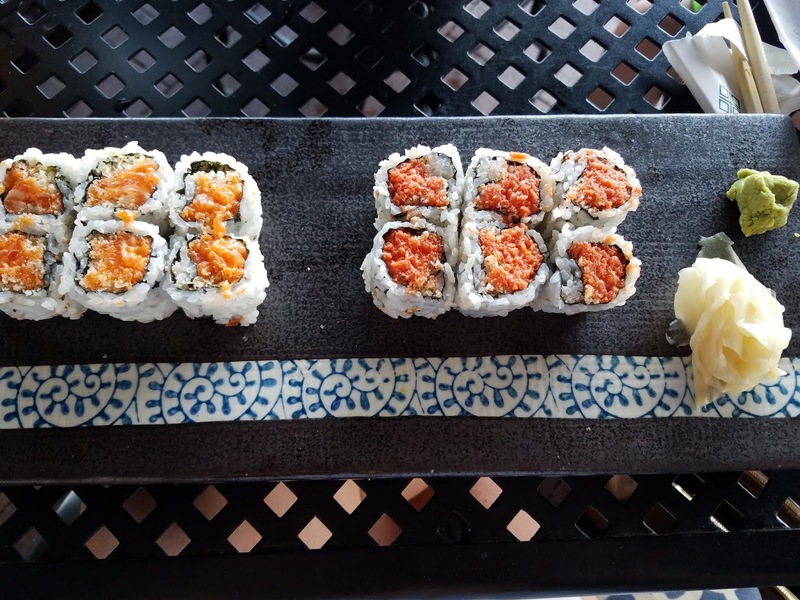 You can get two sushi-rolls, miso soup and a green salad for $8.95. For sushi fans, you know that is incredibly reasonable, but the best part of all, the sushi is delicious. HireScene employees gave me this lunch recommendation and I tried it for the first time this month. I'll certainly be back. I adored the crunchy salmon roll. Lunch is served from 11 am to 4 pm. This family-owned Mediterranean restaurant, located on Beryl Road (Near the NC State Fairgrounds) has been a Raleigh staple since 1989. Using family recipes, the deli offers daily lunch specials along with fresh sides, vegetables, kabobs, and shawarma. When the Saleh family immigrated to the United States in the 1970s, they brought with them their passion for bread along with their mother's recipes. The brothers opened Neomonde Baking Company in 1977, a wholesale bakery and later moved that operation to the Beryl Road location. Neomonde has another restaurant location in Morrisville. 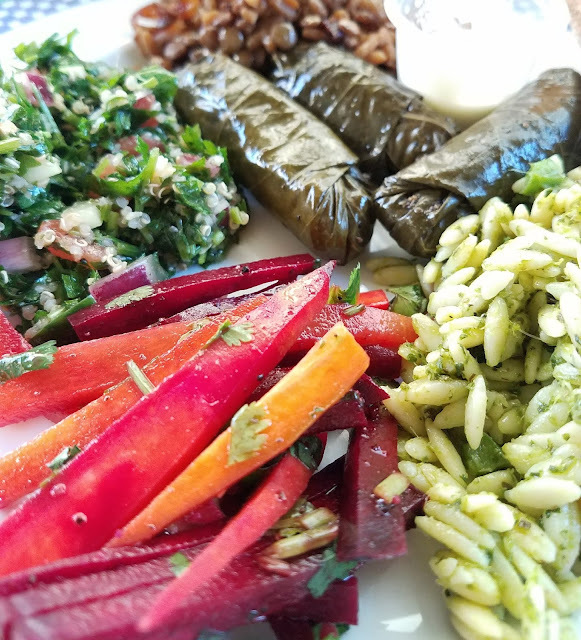 Neomonde is some of the best Lebanese influenced restaurants in the Triangle. They are also a vendor staple at the NC Fair every October. The Player's Retreat, known as PRs, to the locals has been a popular spot since 1951. With lots of gourmet burgers on the menu, it's a hotspot from daytime to late-night. Burgers are a $1 off at lunch, ground from Angus beef on site, and its home to the NCSU Wolfpack Burger, either 4-ounces or 6-ounces, served with mustard, chili, and slaw. The menu has a variety of cuisine and all lunch specials are under $10. This quick-service restaurant off of Western Boulevard that sources local offers free chips and queso with a meal every Tuesday. With a cool salsa bar with condiments and tacos in two sizes, it's easy on the wallet for a lunch-time break. My favorite taco is "Fish Called Wanda" Taco. It's crunchy breaded Alaskan pollock, Mexican slaw, ancho-honey, pico-de-gallo, and jack cheese. 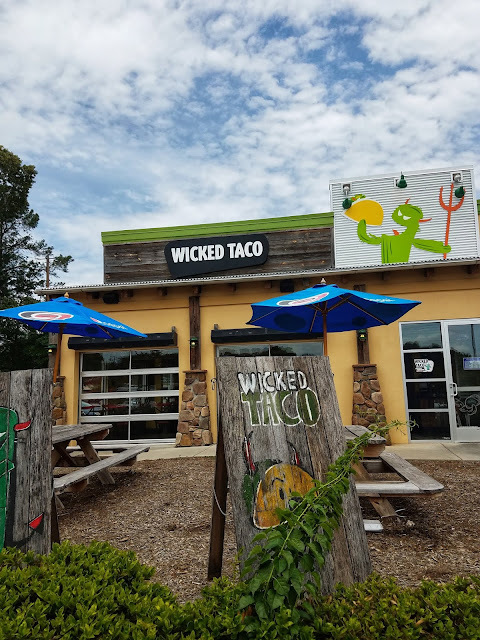 Wicked Taco will open a second location at Morgan Street Food Hall in downtown Raleigh. Nothing screams NC State like Amedeo's Italian Restaurant on Western Boulevard. It's a shrine to NC State athletics and the perfect choice for dining on a college visit to NC State. This college staple serves a daily lunch special from 11 a.m. to 3 p.m. weekdays. 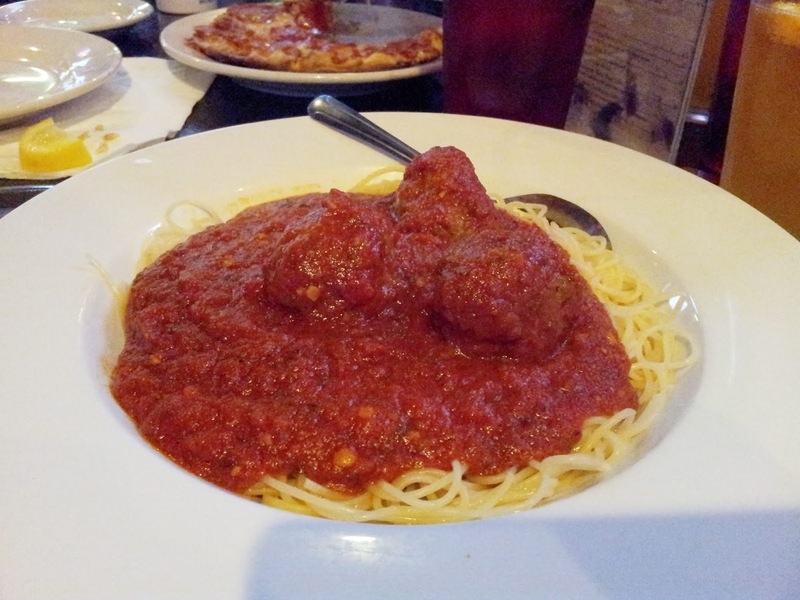 My favorite entree is spaghetti and meatballs, but they have solid pizza, too. Cloo's Coney Island is so retro, it doesn't even have a website. What it does have though is food from a hot grill that will make you drool. Known for its hot dogs and chili-cheese fries, this little restaurant tucked away in Mission Valley Shopping Center off of Avent Ferry Road has been around for 30 years. You can also get cheesesteaks, burgers, gyros and fresh salads. It's open from 11 am to 8:30 pm. The Triangle area has an awesome food truck scene. You can find food trucks parked at breweries, businesses and on NC State's Centennial Campus. NCSU Dining has two food trucks parked on weekdays on Main Campus Drive from 11:30 am to 1:30 pm. HireScene employees tell me that they mark their calendars for the days when American Meltdown arrives on campus. That's a day not to miss, apparently. 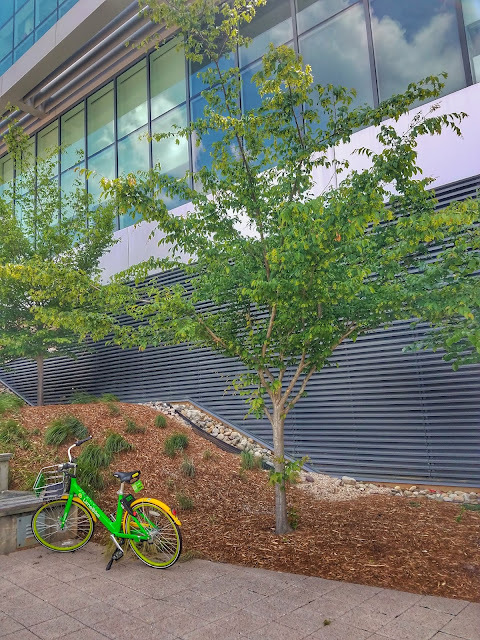 These NC State lunch break ideas were recommendations from my OutaboutNC community and employees of HireScene, which is a Raleigh-based company. While at their office on Centennial Campus, we did some live interviews about their favorite places in Raleigh and I received a demonstration on how this new employment app for the hospitality industry works. Developed by NC State Alumni, it's available for download on iTunes and the Google PlayStore. I was impressed with it and the best way for me to describe it is to compare it to Uber. Hire Scene is a mobile app, headquartered on North Carolina State's Centennial Campus, that has changed the way people work. Hire Scene has partnered with multiple hospitality venues in the Triangle that post to the app when they have a gig available. App Members are notified and get to pick where, when, and how often they work. It's the perfect situation for students who need to work around their school schedule, retirees and people who want to earn some extra money, but need that flexibility. FTC Disclosure: This post was sponsored by HireScene. Hire Scene is a mobile app, headquartered on North Carolina State's Centennial Campus, that has changed the way people work. Hire Scene has partnered with multiple hospitality venues in the Triangle that post to the app when they have a gig available. App Members are notified and get to pick where, when, and how often they work. I love tomatoes. I get most excited in the summer because that is when tomatoes are in abundance. They are fresh, tasty and less costly in the summer. They are even better in a grocery store, but nothing beats tomatoes at a Farmer's Market. 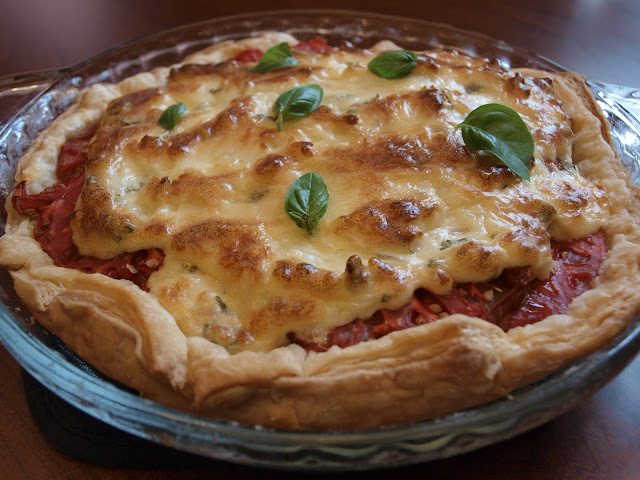 This is also the best time to make a tomato pie, which makes a great side dish or even a main meal with a salad. 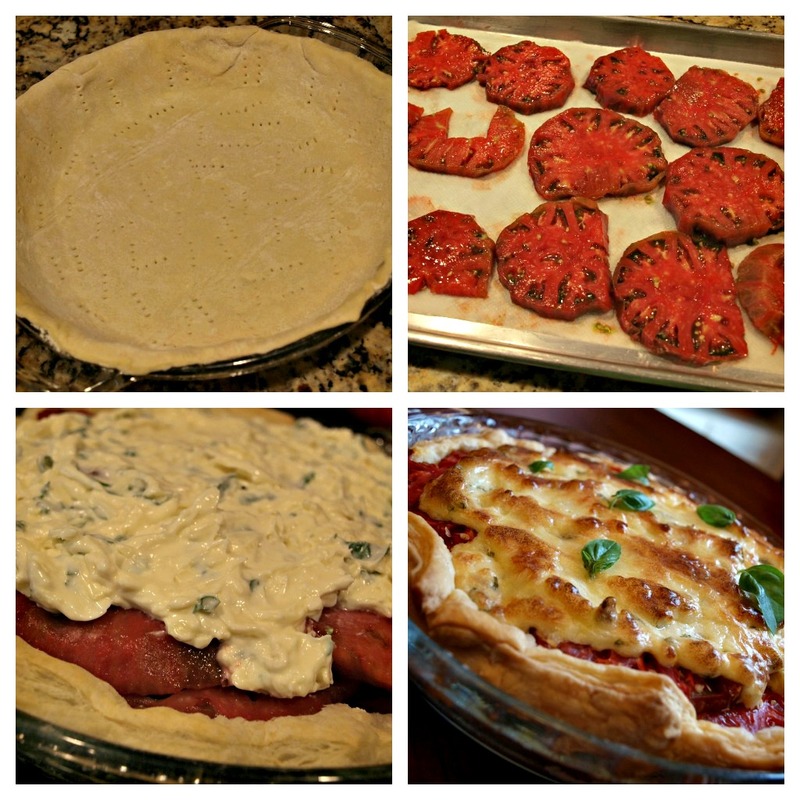 There are several ways to do a tomato pie and a lot of times, the variation is in the cheese that you use. 2. Meanwhile, place tomatoes in a single layer on paper towels; sprinkle with salt. Let stand 45 minutes to an hour. Pat dry with paper towels. Stir together next 3 ingredients and 3/4 cup of cheese. 3. Cut the puff pastry into a 13-inch circle on a lightly floured surface. Fit into a 9-inch pie plate; fold edges under, and crimp. Prick the bottom and part way up the sides with a fork. 4. Bake at 350° for 10 to 12 minutes or until lightly brown. Remove from oven, and sprinkle remaining 1/4 cup cheese over bottom of crust. Arrange tomato slices over cheese in crust; spread mayonnaise mixture over tomatoes. 5. Bake at 350º for 34 to 37 minutes. Let cool 5 minutes before serving. Garnish with whole basil leaves if desired. 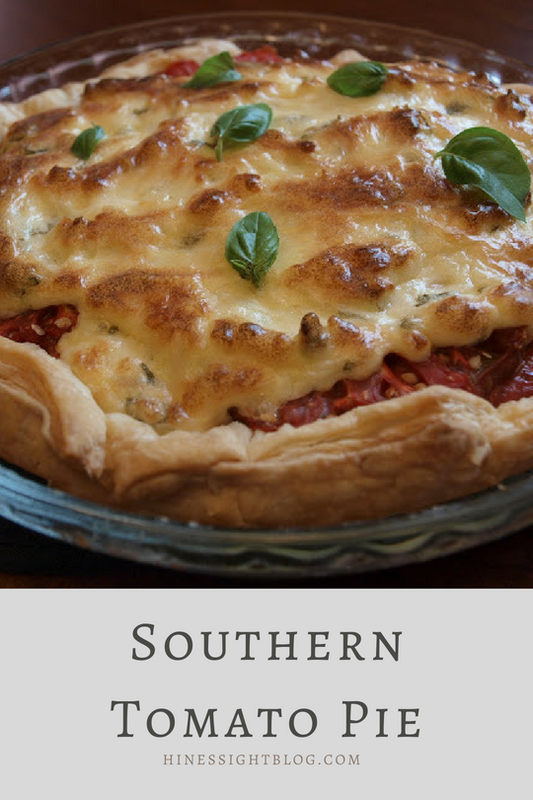 **Leigh's Alternate version of Southern Tomato Pie with onions, pepper, and different cheeses. Add 1/4 tsp of pepper and 1/2 cup of diced onions to the above list of ingredients. Use one cup of Cheddar Cheese and 1 cup of Mozzarella cheese rather than Parmesan cheese. This recipe,, adapted from one of my favorite cookbooks from Edenton, North Carolina, uses a pie shell. Preheat oven to 425 degrees, and bake crust for five minutes; reduce heat to 400 degrees. Remove from oven and arrange thick tomato slices in the shell. Mix salt, pepper, basil, and onion. Sprinkle over tomatoes. Mix mayonnaise and cheese; spread on top. Bake for 35 minutes. Let cool 10 minutes before slicing. You could even be adventurous, and use all three kinds of cheese. Enjoy!